Leaf Chains, sometimes called cable chains or balance chains, consist of interlacing link plates and riveted pins. They are particularly suited for use in lift trucks, counter-weights, and reciprocating motion mechanisms. 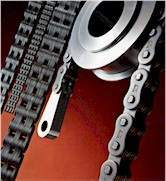 AL Series Leaf Chains consist of link plates of the same contour and thickness as the pin link plates of ANSI roller chains of the same pitch. The pins have the same diameter as those of ANSI roller chains of the same pitch. BL Series Leaf Chains consist of link plates which are thicker and larger in contour than the AL Series link plates of the same pitch. The BL Series link plates are the link plates of the ANSI roller chain of the next larger pitch. The pins have the same diameter as those of ANSI roller chains of the next larger pitch.